THE Civil Protection Unit is on high alert for any disasters including floods this rainy season and Government has since released $1,2 million for any eventualities. This comes as more than 20 homes and a school were severely damaged by hailstorms which pounded Umguza District, leaving some villagers homeless. Umguza District Administrator Mr Tapiwa Zivovoyi said the CPU had been deployed to assess the damage after disaster struck on Monday and Tuesday night. He said most of the homes whose roofs were blown away were those that were roofed using zinc. 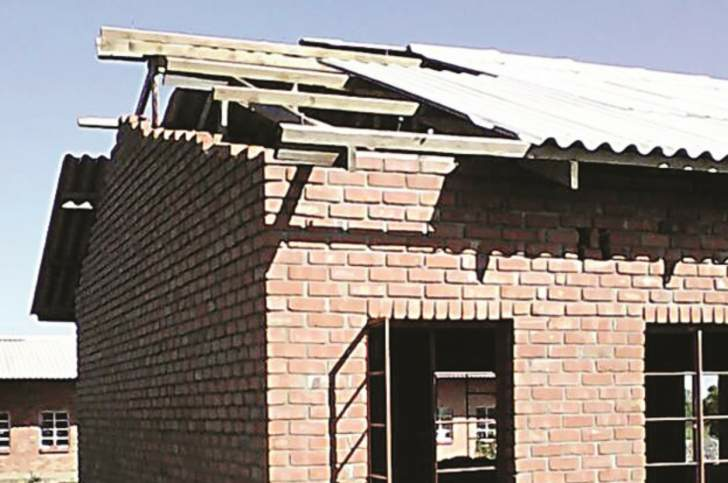 "Umvuthu Primary School in ward 2 had its roof sheets blown away, while nine homes in Village 4 and one in Kensington had their roofs seriously damaged. Another home in village 3 Springs was completely destroyed. Several other homes were also affected in village 2 and Heany Junction area, along Imbizo Road," he said. Mr Zivovoyi said councillors and village heads were still bringing in reports of damages caused by the hailstorms. "On Tuesday, village 7 was extensively damaged and statistics on the extent of damage are still being compiled," he said. Mr Zivovoyi appealed to government and well-wishers for assistance in the form of tents for temporary shelter and resources for people to rebuild their homes as some villagers were now homeless. "Urgent assistance is needed for villagers as more than 20 homes have so far been destroyed by hailstorms which were experienced on Monday and Tuesday nights. There are fears of more destruction if such storms continue. "Meanwhile, the CPU is on the ground educating villagers on safety measures in case storms continue. We are also doing our best to find temporary shelter for those who have been displaced. We appeal for tents and resources to replace roofs of those affected homes," said Mr Zivovoyi. Last year, Tsholotsho, Plumtree among other areas were hit by floods leaving hundreds of people homeless and in dire need of assistance. CPU director Mr Nathan Nkomo yesterday confirmed that the department was on high alert for any eventualities including floods in high-risk areas. "As a department we are fully geared for any eventualities and we are making contingent planning processes for non-food items. We are very happy that Treasury has given us $1,2 million for response and contingent purposes. Although the money came a bit late, it came at the right time as we are already in the rainy season," said Mr Nkomo. He said they have also alerted their partners who are also now on high alert. "As for the Air Force of Zimbabwe, they have given us their requirements. They said they want 320 drums of Jet A1 fuel to be placed at strategic places which they have highlighted to us. "We are waiting for the amount needed as we are not necessarily going to buy all the fuel highlighted but that which we are going to manage depending with the situation. We are also in the process of doing the same thing with the Zimbabwe Republic Police Sub Aqua," Mr Nkomo said. He said Plumtree among other hot spots has been catered for in the preparations for any disaster. "Plumtree is one of them. For instance we have Brunapeg which experienced flash floods last season. The plans also involve other places which experience hydro meteorological hazards. To date we have a few consumables like beds which were donated to us by Zimra. We are looking forward to buying blankets and other items which are non-food items," said Mr Nkomo. Meteorological Services Department head Public Weather Service Mr Tich Zinyemba said the country is not expected to receive any significant rain in the next five days. He said they could not make a prediction now beyond that period. "We are not expecting any rain in the next five days. If anything it will be just light drizzle. From Friday I think we are going to experience hot weather conditions," said Mr Zinyemba. Bulilima district administrator, Mrs Ethel Moyo, whose district was the most affected, yesterday said they were on high alert and were sending messages to flood prone areas to be on alert too. "In Bulilima all the chiefs are on WhatsApp and we are sending messages to them on the weather situation so that they are on high alert. "Villagers living along the river banks of major rivers have also set up committees to be on the lookout for floods," said Mrs Moyo.